I'm happy to report that my last day of 100 is today! While working through this challenge, it really got me thinking about teams, commitments, accountability, setting goals, and celebrations. Which then got me thinking about how many clients we work with that struggle with these same concepts when it comes to CRM adoption and accountability. So I want to take some time to walk you through how our burpee challenge came together, what I learned from it and how it can be applied to CRM users. As we were getting started we realized we had to define some guidelines - yes rules - even for burpees! We talked through things like, "do they have to be full burpees, or can they be half or quarter burpees? ", "is it every day or do we have any days off? ", and "how do we report that we've done them?". Getting these questions answered helped the invitees make the decision as to whether or not they felt like they could get on board and commit to the challenge. Once I accepted, my friend added me to the social media group where we would be collaborating on the challenge. I was greeted with the following meme, "You gonna cry about it or boss up? First of all, I'm gonna do both." Excellent!! I'm so glad we're all on the same page, as we were all starting to realize that this challenge was no small feat! When we look at this from a CRM perspective, it is important to clearly state the goal. In other words, define the why. Then as our little group did, work together to clearly define the parameters by which the team should operate. It's important to get agreement on this and for everyone to feel like they've been heard. If users don't feel like they had an opportunity to contribute to shaping those guidelines, it may be difficult to get them on board and fully committed. Our fitness group already had clearly defined milestones when we were invited to participate. The number of burpees completed each day for that week, with the week running from Saturday through Friday, then move on to the next level. From a CRM perspective, setting the milestones is really important. We like to ask our client teams to start by defining a small quickly attainable goal, a.k.a SQAG. Then we ask them to set a target goal, this is where the team should settle back to after they've reached the third and final stretch goal and have settled back down into a new norm. This is the fun part! In starting the challenge, I was initially only thinking about the difficulty of what I was about to endure… can you blame me?! But then, I started to think about all of the benefits I was going to gain. Increased cardio capacity. Stamina. Strength. Increased muscle. So many things! So, take the time to let the team dream up some fun ways to reward itself when it meets those milestones along the way. They don't even have to be super expensive. In fact, they should be big on fun and be something that the team can do together. Set the Tone. 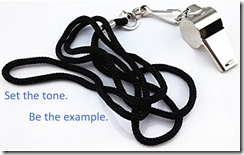 Be the Example. In our fitness group, this came naturally to most of us! We "liked" one another's posts, we provided words of encouragement and gave kudos for every person that completed the challenge. Every. Single. Day. We didn't let a single person go even one day without letting them know that we noticed the hard work they were putting in. I cannot stress enough how important this was. In a work setting, saying this type of behavior is a challenge is a huge understatement. People just aren't wired to be cheerleaders in the office! It feels awkward right!? But why? That's another whole conversation that I'm probably not qualified to speak about - we may need to call in a therapist for that! Nevertheless, make it a weekly conversation. Take the time to recognize a job well done for each person that contributed to the goal during that week. People might feel a little uncomfortable or awkward at first, but pretty soon it will become second nature and people will begin to feel like they're a part of something bigger than themselves. It became obvious pretty early on that each of us was thriving on our teammates posts. I would check in each day to see who had been able to get the burpees in. It felt good to know that someone noticed that I had gotten mine in. And I didn't want to miss posting, because I didn't want anyone to think that I hadn't gotten them done! I'd like to think that my commitment helped others to remain committed as well. Our group was also vulnerable enough to admit when we missed a day. But we also knew we were going to suffer the consequence of making up that missed day. Let me tell you, when you get upwards of the 50 per day mark, you don't want to miss a day! That was enough consequence for us to commit to getting and staying back on track. But because we had such a supportive group, it was ok to admit that misstep because they were cheering you on the whole time you were suffering through the consequence. So what this means for our CRM users is that they need to be vulnerable enough to cop to the misstep when they didn't work toward the goal on a particular day or week. And they need to be willing to accept the fact that they may have to answer to the peers that did put in the hard work. But also know that those same peers should be there to help them if or when they need it. So what's the official methodology I've been rambling about? It's called LUCKscore! We Listen up front to define goals based on the needs of the business and the team. We Understand by working together to define guidelines and celebrations. We Connect by meeting and holding one another accountable throughout the life cycle of the plan. We Know by measuring our results (ideally in CRM!) against the goals we set. 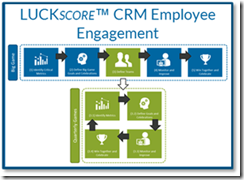 LUCKscore integrates business growth, CRM adoption and individual performance. To be successful, it requires the engagement of executives, managers and front-line employees on a regular basis. An initial plan is set that identifies annual and quarterly goals, and team celebrations are defined. 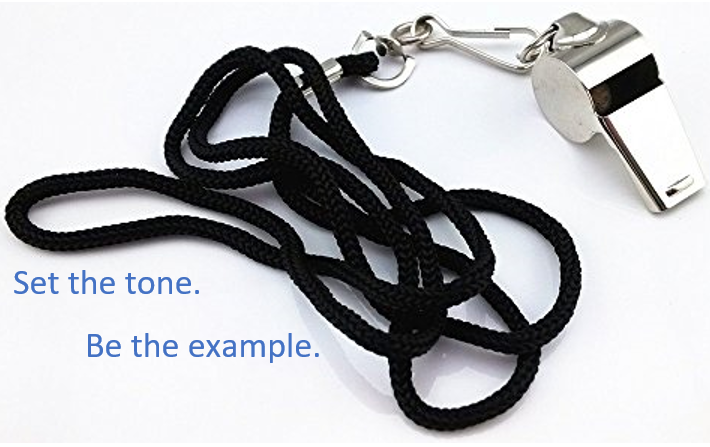 The entire team wins or loses together on a regular basis – thus fostering short-term rewards, recognition, and greater collaboration and team usage of CRM (one team member that misses a goal can mean the entire team misses an opportunity to be recognized). 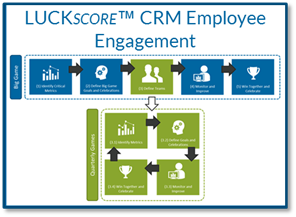 Want to learn more about LUCKscore employee engagement, user accountability or adoption? Contact C5 Insight, we'd love to chat about your situation and needs!